Showboat & Pioneer Place. Mark Bergen, Dir. I had a fantastic time hosting Toro’s 100th Anniversary event at the Xcel Center in St Paul, MN! Happy Birthday Toro! 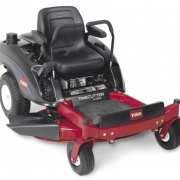 In honor of your birthday I bought one of your lawn mowers. We both win!